I’m fond of saying that the size of the space really doesn’t matter. It’s how you utilize your space that counts. But can you really create comfortable living in a 130 sq. ft. room? Yes! This micro apartment is a perfect example of what can be done with intentional design and mindful planning. Natural light helps enhance the open feeling to this room as does the sleek, trim modular pieces. 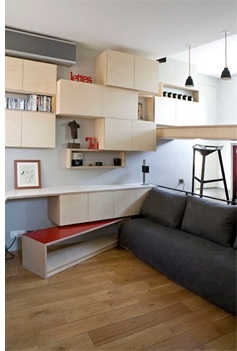 As always, built-ins that do double duty like the storage stairs and slide out bed/sofa work are smart choices. Add a fresh flower, a yellow throw pillow and you’ve got a cozy place to call home. Of course, living large in a small area requires downsizing effort and letting go. But isn’t that what getting clear is all about? Bottom line: if you think you are stuck for space … think again!